cloudscale.ch Review 2019: Is cloudscale.ch a Good Hosting? cloudscale.ch is a Swiss website hosting provider. Their niche is virtual machines that can be set up instantly using their extremely user-friendly control panel. Founded in 2014, cloudscale.ch is a Switzerland-based company selling self-service cloud platforms that allow the customer to launch virtual machines instantaneously. The company is pretty small with fewer than ten employees, but they operate an immaculately-maintained data center located in Switzerland. Their website is available in German and English and they serve customers all around the world. cloudscale.ch houses all their machines in a data center located in Switzerland. Not only is this facility immaculately maintained, but it’s also ISO-27001 certified, complies with FINMA RS 08/7, and has 24/7 security monitoring. They use high-end networking gear with international peering and offer high availability with a superior 99.99% uptime SLA. As the center is located in Switzerland, you’ll enjoy an added perk: your data falls under the protection of Swiss data protection and privacy laws. They offer eight packages: Flex-2, Flex-4, Flex-8, Flex-16, Flex-32, Flex-48, Flex-64, and Flex-96. All these packages are so named because of the amount of memory included: Flex-2 comes with 2GB RAM, Flex-4 comes with 4GB RAM, and so on. The vCPU increases from one to 16 depending on the plan, while all plans come with 10 GB SSD storage by default. You can easily configure the plan by adding extra SSD storage, HDD storage, additional IP addresses, and more traffic per month. All of the plans use SSD, which means disk read/write times up to ten times faster, a simple control panel, full root access, flexible scaling so your resources increase with your requirements, and instant setup. They also offer you the choice of eight Linux operating systems: Ubuntu, Debian, CentOS, Fedora, Arch, Gentoo, CoreOS and RHEL. Your servers come with open-source technology such as OpenStack, KVM and Ceph. Their setup processes (and their website) are very, very slick — they’re designed to streamline hosting processes for developers, after all. You can quickly login and create new virtual servers and configure your resources as required. Just be warned: backups are 100% your responsibility! Considering these are premium virtual machines, the absolute prices are considerably higher than your average virtual server. However, you get far better performance, uptime, and support with these machines, so overall these packages are great value. What’s really nice is that you’re billed daily for the resources used within the last 24 hours, so you’re not paying for resources you don’t use. You can cancel anytime, but there are no refunds on payments. Support for existing customers is handled through their control panel and by ticket; alternatively, you can reach their sales team by email or phone. It’s not clear what their business hours are or what their average response time to tickets is. All I can say is that every time I’ve contacted them by email, they’ve responded straight away and been very helpful. They don’t have a knowledge base or FAQ section on their website, sadly — presumably because they’re marketing primarily to developers. 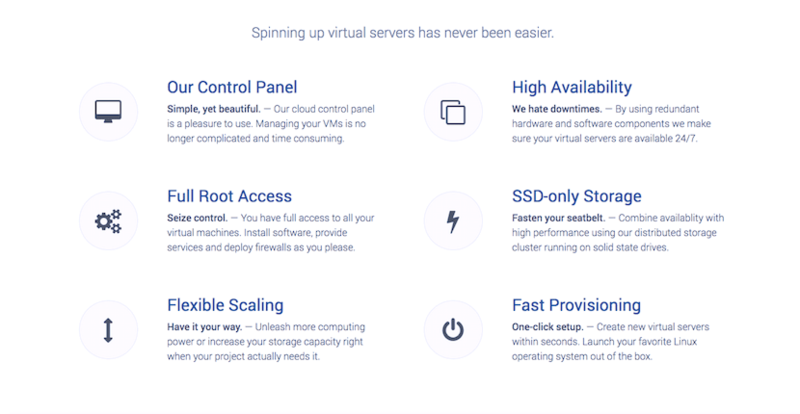 cloudscale.ch offers a simple selection of cloud servers that can be launched within seconds. These are certainly not for beginners; however, experts will love their sleek interface, configuration options, and scalability. Wondering how cloudscale.ch stacks up against other Web Hosting companies? Enter any other Web Hosting company and we will give you a side-by-side comparison.